So much for End the Fed under President Donald Trump. Donald Trump’s fierce criticisms of the Federal Reserve in the final weeks of the 2016 election campaign suggested the central bank would face a rough time with the new administration. Instead, the nation’s two most powerful economic-policy players—the president and the leader of the central bank—are off to a surprisingly smooth start. she was doing a good job, according to people familiar with the exchange. Ms. Yellen sat across from Mr. Trump in a chair next to Gary Cohn, Mr. Trump’s chief economic adviser, who has emerged as the key intermediary in the unfolding relationship with the Fed. The president told Ms. Yellen he considered her, like himself, a “low-interest-rate” person. During a roughly 15-minute conversation, they discussed how economic policy might help the millions of Americans who felt left behind during the postcrisis recovery. 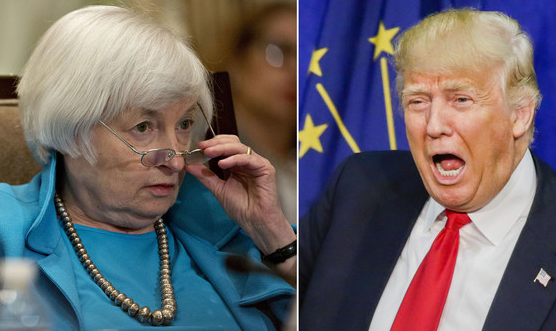 Two months later, in an interview with The Wall Street Journal, Mr. Trump said he hadn’t ruled out nominating Ms. Yellen for a second term before her current one expires next February. The White House’s National Economic Council, led by Mr. Cohn, is about to begin the process that will decide whom to nominate as the next Fed chairman, according to a senior White House official. Some observers caution against reading much into Mr. Trump’s silence on Fed policy because the central bank hasn’t done anything to upset the administration. Stocks have moved to record highs while federal borrowing costs have fallen. A Fed move this week would lift its benchmark rate to a range between 1% and 1.25%, a still very low level historically. “The minute that Morning Joe has a report about a Fed action that could harm Donald Trump, set an egg timer and see how long before he tweets,” Mr. Conti-Brown said. If Conti-Brown is correct, and he probably is, Trump is more of a money printer than even Yellen. But the Fed already raised rates 25 bps three whole times in the past three years, right? According to this article, federal borrowing costs have fallen and stawks are at all time highs. Yet the article also states that Trump might deem further Fed rate hikes "threatening" (to stocks?) (the economy?). I wonder why? He must be some kind of Austrian-lite or something. What? A realestate investor that favors a low interest, high inflation monetary policy? I'm shocked, I tell you. Shocked. During the campaign, he stated as much but he also accused the Fed of keeping rates low to "help" Obama because he suspects higher interest rates will explode the phony bubble economy. Now he wants to make sure the Fed doesn't do that to him. This kind of thinking is very Austrian-lite and puts the lie to the view that the Fed has truly raised rates in any meaningful way.